From when we receive your emailed wording and payment and Design # from our website. And choose which card stock you would like them printed on. Choose from ONE of our existing Designs. 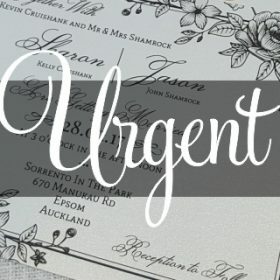 See Invitations for different sizes and designs 100’s here. ARTWORK (includes up to TWO emailed Proofs for changes) to update our template to your wording. 3 Day or 7 Day Business Days Turnaround from receiving your EMAILED wording and payment. The artwork includes up to 2 emailed proofs, any extra changes will incur a charge of $20 each time * this may delay it.